This could be the startup of something big. Thanks to a gift from generous donors, a new fund at NC State University will provide solid support for budding student entrepreneurs. Alumnus Robert “Chip” F. Andrews III – who earned his B.A. in economics from the university in 1966 and is a current member of the Board of Trustees – and his wife Lyn have committed $1 million to establish the NC State Acceleration Fund, which will award grants annually to student startup companies. The Raleigh couple is encouraging other donors to contribute. Chip Andrews, retired former chairman and CEO of FMI Corporation, hopes the unique gift makes a positive impact on young people and on economic development. Many millennials are creative, passionate and driven to pursue their own ventures, Andrews said. But students often face limited access to funding, inexperience in attracting investors and student debt – on top of the inherent risks, roadblocks and family economic pressures that even seasoned entrepreneurs face. The Acceleration Fund aims to improve their chances. The grants program will be administered through the fast-growing NC State Entrepreneurship Clinic based in the Poole College of Management. Ira R. Weiss, dean of the college and Stephen P. Zelnak Jr. chair, praised Chip Andrews’ volunteer role in the clinic’s success and thanked the couple for setting an example. Private support is critical for NC State to be competitive. This gift from Chip and Lyn Andrews is an investment in our future, the kind of investment that drives Think and Do – the hands-on innovation that NC State personifies. Their gift is an endorsement of the remarkable momentum we are experiencing at NC State with the growth and maturation of our entrepreneurship curriculum. The initial grant recipients will be announced later this spring. Juniors, seniors and graduate students, as well as recent graduates, from any curriculum at NC State are eligible to apply. For this first year, a committee will interview five finalists and award one or more grants; a total of $50,000 will be distributed. As the Acceleration Fund grows, the amount and number of grants can grow. In addition to equity-free funding, a critical component of the new effort will be a three-month “boot camp” that grant recipients must complete. Through this Andrews Launch Accelerator, students will receive educational and coaching support from successful local entrepreneurs; pro bono legal, accounting and talent acquisition services; and office space. The program initially will include modules on customer needs analysis, market research and validation, financial planning, legal planning, presentations and launch strategy. The goal is to help students develop a viable business model and perfect how they communicate that opportunity. “The core concepts will continuously evolve and improve,” Andrews said. Participants will benefit from access to banking relationships, and exposure to angel investment and venture capital networks. In fact, the first program will conclude in August with a demo day showcasing grant recipients to invited industry and community leaders, faculty and students, and potential investors. Hundreds of accelerator programs exist nationwide, many established in coordination with colleges and universities. Stanford, for example, plays a valuable role in the entrepreneurial success of Silicon Valley. 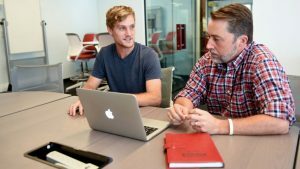 NC State’s program builds on the foundations of its Entrepreneurship Clinic – an outreach of the Entrepreneurship Collaborative (EC) based in PCOM, with collaborations that include the Garage on-campus business creation and prototyping space. The clinic has enjoyed quick expansion and increasing energy since launching in January 2015. Housed in HQ Raleigh, a co-working downtown space that is home to a growing community of entrepreneurs ranging from software developers to educators, the clinic is a place where NC State’s team of commercialization experts consults with companies and institutions around the world. Students are embedded in the entrepreneurial community there, completing research projects and providing consulting services in a setting modeled after the teaching hospital where i research, teaching and real-world experience combine to provide an integrated learning experience. The Entrepreneurship Clinic enrolled nine students for credit during its first semester in 2015; over the course of that semester, 96 more students volunteered or worked on projects as part of other classes. David Lee Kincheloe, a senior business administration major in the Poole College of Management, works on a client project in the Entrepreneurship Clinic with Lewis Sheats, director of the clinic. The Andrews Launch Accelerator is a natural extension of NC State’s entrepreneurship curriculum, said Sheats, who will oversee the accelerator’s development and implementation, and the Acceleration Fund will continue moving the needle on nurturing new ventures. Already, several concepts have been born within the entrepreneurship program, Sheats said, ranging “from tech to no tech, apps to retail and b2b to b2c type companies.” Program alumni’s recent startups include Pitch & Primer, Seventeen Twelve, Filter Easy, Medicom and Gryppers. The Andrews’ gift strengthens the supportive entrepreneurial environment being established at NC State and can play a critical role in fostering the next generation of North Carolina businesses. Raleigh, Durham and Charlotte are positioned well for success but competing for startup activity with other appealing urban areas such as Salt Lake City; Seattle; Nashville, Tennessee; Austin, Texas; and Jacksonville, Florida. We want students to be successful and we want them to stay here. Chip and Lyn Andrews are members of the university’s C.W. Dabney Lifetime Giving Society, Pullen Society and Chancellor’s Circle. They have provided financial support for ARTS NC State, including naming the Garden Hall of the Gregg Museum of Art and Design; the Fails Fellow Endowment and various programs within Poole College of Management; the Alumni Association and other areas. This gift brings full circle Chip’s longtime advocacy for entrepreneurship education and passion for mentoring. Currently a managing member of Andrews Ventures LLC, which manages real estate and venture capital investments, Andrews also serves as managing director or president for several other LLCs and maintains numerous board affiliations. He retired in 2014 from FMI, where his career began in 1967 and where he worked with one of his own greatest mentors. Andrews grew up in Brevard and, interested in engineering, chose NC State over other prestigious institutions. Initially, Andrews joked, he really majored in extracurricular activities that included Sigma Chi fraternity (vice president), Technician (photography editor), and service on the Bragaw Board of Governors and as vice president of his freshman class and president of the student body during the 1965 summer term. Before long, he decided that a career in business might suit him better. During his junior and senior years, the economics curriculum finally inspired excitement and commitment. One memorable semester-long project, for example, required him to suggest improvements for the campus’ increasing traffic problems. After analyzing factors that included construction costs, land use, university policies, and the actual and projected number of vehicles, he recommended two new parking decks – one by Reynolds Coliseum, later built – and bus service. A thread of engineering and construction continued to weave through his story as it intersected with Dr. Emol A. “Doc” Fails, founder of FMI. At about age 50, Fails would resign his tenured position as a highly regarded economics professor at NC State to join a few 20-somethings in building the successful management consulting, training and investment-banking firm serving the international engineering and construction industries. Andrews called Fails an incredible mentor who enabled those around him to take risks, make mistakes and learn. By the late 1970s, meanwhile, Chip began to re-engage at his alma mater. He and Lyn became active in championing arts programs, initially as founding members of NC State’s Friends of the Gallery. Chip later completed a term as president of Friends of the Gregg Museum and a term on the Board of Visitors, as well as volunteering with the Center for Economics and Business Studies and the Campaign for NC State Students. His long service on the Graduate School Advisory Board, with then-Dean Debra Stewart, and on the PCOM Advisory Board, with Weiss, inspired him to become more involved directly in volunteering with students, through programs such as PCOM’s Showcase. And he became more interested in helping to jumpstart opportunities and prevent predictable mistakes. At the Entrepreneurship Clinic, Andrews has been active with the intensive mentoring program that currently includes 24 student-mentor pairings and ten “roving” mentors. Last fall, Sheats began valuable monthly mentor-mentee gatherings where students can initiate discussions about challenges and obstacles. The Acceleration Fund and Andrews Launch Accelerator will help ensure that. “We challenge others interested in driving economic development and innovation in North Carolina to join Chip and Lyn in contributing to the NC State Acceleration Fund. This is just the beginning,” Weiss said.